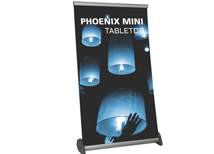 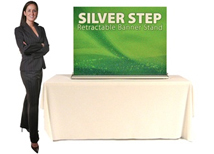 Table top banner stands are a great way to display your message without taking up a large amount of table space. 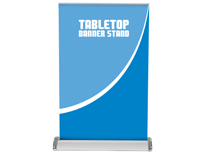 These banner stands are great for detailed information and bullets points. 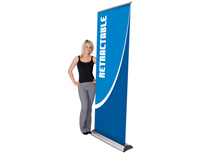 These banners can be used with our full line of table throws to create a eye catching and professional trade show booth. 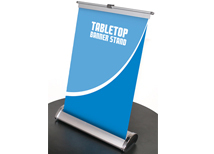 We also carry adjustable height banner stands that can be used as a table top or full height unit. 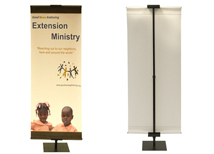 Size - 12" x 42"
Height Adjustable from 45" to 54"
Size - 31.5" x 29.5" to 83.35"
Table top banner stands are a cost effective way to present a message in a small area. 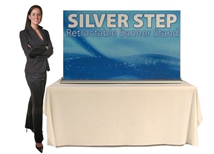 These banner stands are very compact and are easy to take on planes and in vehicles. 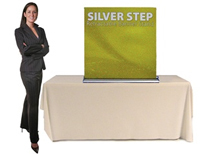 All graphic printing is done locally in the US for fast turnaround and affordable pricing. 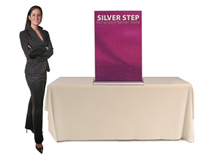 We also carry a full line of table top displays including table top pop up displays and portable table top displays.